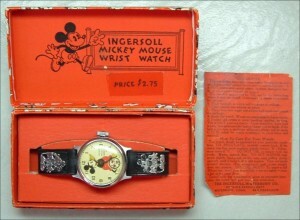 Vintage Mickey Mouse Watch Repair – I Already Have a Watch. They’re certainly not haute horlogerie, but I’ve always had something of a soft spot for these vintage Ingersoll Mickey Mouse Watches. These were among the first “character watches” made and were the first watch of much of a generation, or at least those children lucky enough to get one in the Depression years. Originally made by Ingersoll (of “Dollar Watch” fame) they were later made by US Time and then Timex after a series of mergers and corporate name changes over the years. There’s just something really endearing about them, though they’re not quite endearing enough for my personal tastes at the prices they fetch. A few years ago I had an idea to find an old junker Mickey Mouse Watch and get it restored, thinking I might be able to get my way into one cheaply. I never found a suitable one at a reasonable price and gave up on the idea in favor of other interests. Along the way I did however find a watchmaker suitably equipped with a supply of NOS parts from the old Ingersoll facility in Waterbury, CT who restores these cute little old watches. For repair and restoration of vintage Mickey Mouse Watches there’s probably nowhere better than watchspot.net, who also maintains an the eBay Store Finetimepieces . With the problems of age and parts availability, few to no other watchmakers can handle projects like these. Better still, given the benefits of modern synthetic lubricants, timing equipment, and the deliberate focus of an able watchmaker as opposed to the mass-production assembly line manufacture these were originally made with, while it probably won’t be performing to chronometer standards it’s very possible that it will come back running even better than when new. Tidbit: the $2.75 price on the tag of pictured example works out to about $45 in 2009 dollars adjusted using the consumer price index. Tagged with mickey, Vintage Watches. How can you tell a Mickey Mouse Timex, how old it is. it has yellow gloves on, white face with red numbers and red band?